And how are they best used? Nature has provided thousands of natural medicines and natural antibiotics over millennia. Most people are unaware, but virtually all pharmaceutical medications originally came from the plants of the Earth. After they were proven effective in treating various ailments, the pharmaceutical industry then created synthetic variants which they could patent. In this way, they retained the exclusive rights to earn revenues from their patents over a specific period of time. The point is that every medicine under the sun originated as an herb or a spice, a tree leaf or shrub root, a berry or a fruit. Fortunately, some of these same medicinals function as very efficacious natural antibiotics. Especially when they are prepared properly, these potent medicines can produce the desired effects without many of the adverse side-effects associated with pharmaceutical-grade antibiotics. High-powered pharmaceutical antibiotics certainly have their place in today’s society. But the proliferation of so many antibiotic-resistant strains of bacteria (as well as other infections) has warranted a new class of similar yet even more potent medications. There is a downside to many of these in that they can leave residues within the human body which sometimes require a deliberate process to remove or detoxify. There are many illnesses and diseases which do respond favorably to natural antibiotics. Though the key is to know which antibiotics best address which ailments, as well as which types of formulations are the most effective. Of course, the sooner one takes a natural antibiotic protocol, the greater the likelihood that they will successfully address the infection or inflammation. The oils of oregano, thyme, and basil have also proven to have strong anti-microbial properties. So have the oils of basil and lavender. Oregano oil is especially effective at addressing infections within the GI tract, and is regarded as a particularly powerful broad-spectrum natural antibiotic. Because it is so potent, it should be taken with the understanding that it can produce a healing crisis from the bacteria die-off that it is known to cause on occasion. Honey has been used for millennia to speed the process of healing of the skin as well as the mucous membranes of the GI tract. Manuka honey, in particular, appears to have very strong antibacterial qualities. Here is an in-depth post outlining the many other health benefits of honey. An experienced cook knows how to introduce both garlic and turmeric into at least one meal a day. Likewise, ginger and honey can easily find their way into the diet on a regular basis once their benefits are fully understood. It should be noted that honey should never be cooked or heated as doing so can create toxins. Also, too much ginger can be drying for some, so one should use it appropriately. Nevertheless, many within the culinary realm of the East use ginger every day for its powerful abilities to ward off sickness. What are some other natural antibiotics? Pau d’Arco tea is another broad spectrum natural antibiotic which possesses particularly strong anti-fungal properties. It can be quite effective in treating candida albicans overgrowth in the gastrointestinal tract. Pau d’arco comes from a tree bark in the South America rainforest and high Andes which was observed to be unusually resistant to many of the diseases that often occur in those climates. Grapefruit Seed Extract is another very popular anti-microbial that has been used frequently to treat candida overgrowth, as well as a variety of bacterial infections. Many folks even use it as a safe yet effective way to clean and disinfect their produce and other foods. Further, many individuals have used the well-known echinacea and goldenseal herbal formulation for decades in treating colds and flus, sore throats and other upper respiratory ailments. Preparing their medicinal herbal teas with raw, organic, unfiltered honey is another way of receiving one of nature’s best medicinal superfoods. Various oils such as oregano, thyme, basil, lavender, and more. 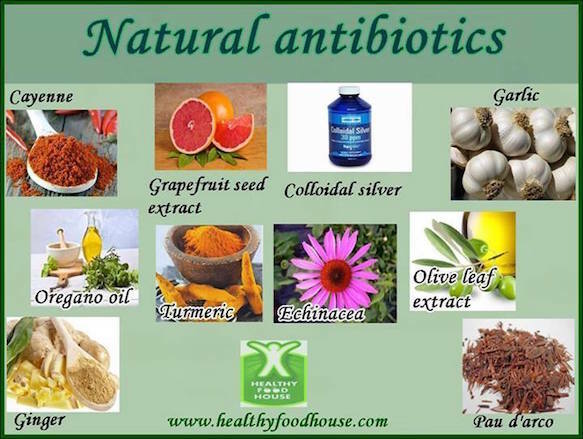 There are several excellent natural antibiotics which can be used by those who have proven to be allergic to pharmaceutical-grade antibiotics. These can also be used as the first line of defense against those seasonal ailments which require a fortified immune system. There are many different sources of infection, including bacterial, viral, parasitical, fungal, and more. Therefore, it is always advisable to receive an informed opinion from a healthcare professional about the likely source and seriousness of any infection. Consulting an herbalist, naturopath, or oesteopath about which choices are best to use from nature’s pharmacopeia is recommended in any case. Oil of Oregano is highly effective (not oregano oil) as an antiviral, antibacterial and anti-fungal. Surprised it wasn’t included in the list. Oil of oregano and oregano essential oil are two VERY different things 🙂 Oregano essential oil is NOT safe for ingestion and must be heavily diluted when used. Oil of oregano is a powerful infused blend using the herb, not the essential oil, and is safe for ingestion as well as topical use. Oregano oil is highly effective as an antiviral, antibacterial and anti-fungal. I’m surprised that you would qualify it as not being such a beneficial natural approach. We use it regularly, not only internally but topically when the situation arises. I was diagnosed with dermatitis/eczema and told there was no cure only to use whatever lotion would make it feel better. I ended up treating it with oil of oregano topically and internally and it disappeared. While many of these natural “antibiotics” work in-vitro, they don’t work so well in-vivo. The only natural “antibiotic” that works in the body is lytic bacteriophages. Au contraire—last fall I had a painful bladder and prostate infection caused by a compression injury (squat cleaning a barbell, something I hadn’t done in years). I expended $6.95 in a cheap bottle of garlic tablets and took three every four hours. The infection was gone in four days. Your in vitro dogma is just that. You hold shares in which companies? The infection I doubt would have happened at all besides an enlarged prostate, which has alleviated with use of lycopene. As always, nutrients are needed and 90% of “medications” should exist only as formulas in computer files. Friends don’t be dazzled by scientific terms so that you don’t give nature a chance—avoid medical shakedowns.